I’ve never really found any definition or account of the “self” to be satisfactory. To me, it’s the single most important question to answer, but I never seemed to make any progress. The self is something unique, the set of all essential qualities making someone distinct from everyone else. I’ve never been able to find any criteria which can set us apart from one another, and that has always troubled me. I found myself falling back on the existentialist philosophy of Jean Paul Satre, and I conceived of myself as a sort of “freedom”. If you’ve read his book Being and Nothingness, you’ll find it’s a book intended to battle determinism and any casual influence over us. Though a great read, overall, the idea of “free will” doesn’t make any sense. I don’t see any evidence that we have such a thing, and the more time I’ve spent dissecting the idea, I can’t understand what such a concept would even be. I’ve written about it before, and there’s no need to go into all of it again. I read John Locke, David Hume, Hegel, and others. How could I define myself, distinguishing myself from others and the world around me? I thought that maybe it’s our thinking processes which set us apart. But no, animals can think too, just not to same degree we can. Before long, we’ll have computers which will be able to out-think all of us, but will they have a “self”? Their neural networks will process information according to the same algorithms our brains use, but whether or not they’ll be conscious, who knows. As I’ve written neural network algorithms which emulate many forms of intelligence, I find human intelligence to just to be one algorithm our brain does, and it isn’t nearly as remarkable as people think it is. In fact, I’d argue that we humans aren’t all that intelligent. If we were, we wouldn’t struggle to exist and there wouldn’t be so much poverty and misery. I thought that maybe it’s our memories and the timeline of our lives which define us. But no, memories can be altered either by brain damage, disease, or if you were skilled enough, inserting false memories into someone’s brain. Maybe we’re our physical bodies or our desires? But no, none of those work either. Our bodies are changing every day, cells dividing and splitting, and old cells dying. Every so often, our entire bodies are rebuilt from new materials. The same materials are reused by all of us. And our desires are created by our brains. If you alter your brain, you alter your desires — and the brain is chemistry all the way down. Quantum effects are negligible at the scale of neurons. To top it off, a person’s desires can be changed by what they know, and we learn by our experiences. It’s “your” desire until you learn there’s better choices you could make. When would that process ever end? It doesn’t. All evidence suggests we’re determined. What you want is to feel happy and satisfied. What you actually experience and do is beside the point. Personhood is a foundational concept in ethics, yet defining criteria have been elusive. In this article we summarize attempts to define personhood in psychological and neurological terms and conclude that none manage to be both specific and non-arbitrary. We propose that this is because the concept does not correspond to any real category of objects in the world. Rather, it is the product of an evolved brain system that develops innately and projects itself automatically and irrepressibly onto the world whenever triggered by stimulus features such as a human-like face, body, or contingent patterns of behavior. We review the evidence for the existence of an autonomous person network in the brain and discuss its implications for the field of ethics and for the implicit morality of everyday behavior. In addition to visual shape features such as static eyes, faces and bodies, certain patterns of motion are also effective at engaging the system. In particular, contingent “behavior,” by which a stimulus seems responsive to its environment, can evoke a sense of intentionality and personhood. In the famous animated film of Heider and Simmel (1944) two triangles and a circle move around the screen with motions that are interrelated, giving an impression of three entities interacting with motivations and intentions (see http://pantheon.yale.edu/~bs265/demons/causality.html). The automaticity of this attribution is apparent in the difficultly of describing this film without using psychlogical terms such as “wants” and “tries” (Scholl and Tremoulet 2000). This automaticity seems related to the trigger of the person network, in that a patient with complete bilateral amygdala degeneration described the film purely in pshysical terms (Heberlein and Adolphs 2004). Brain imaging studies of Heider and Simel-type animations show that all of the brain regions shown in Figure 1 are activiated (Castelli et. al 2000; Martin and Weisberg 2003; Schultz 2003). For example, in the study of Martin and Weisberg (2003), two sets of animations were presented: both were composed of moving squares, triangles and circles, which moved in a contingent interactive manner (e.g., as if dancing together or chasing each other) in the “social” set and in a manner consistent with mechanical motions (e.g., like billiard balls or objects on a conveyer belt) in the “mechanical” set. 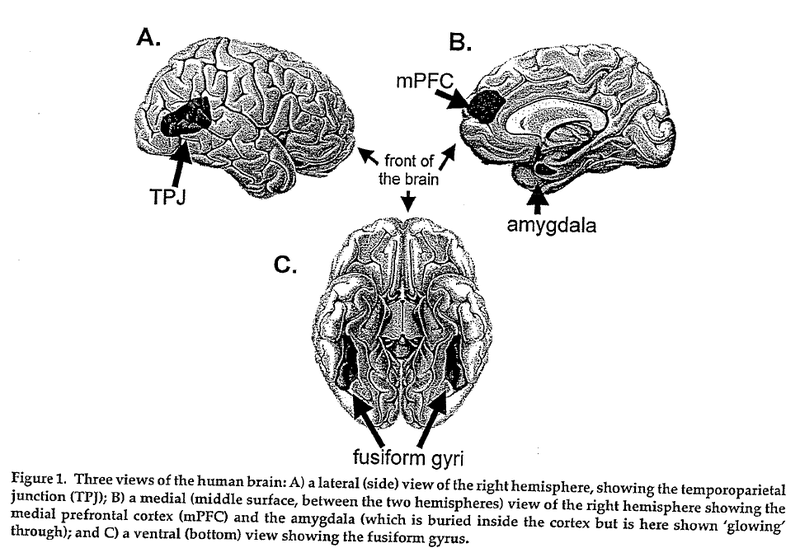 Despire the absence of anything resembling a human being in these animations, the former set and only that set activated the fusiform face area, amygdala, temporoparietal junction and medial prefrontal cortex. After I read this I thought, “Of course!” When doing research on space and time, I wanted to know how well the brain intuitively understood the laws of physics. It turns out that we have a system which is alright at judging the movements and behavior of objects in certain everyday situations, but it’s lacking in many ways. Take a common mechanics problem. Say you place a solid wood cylinder beside a hollowed out aluminum can, both with the same radius, and roll them down a ramp. Which will reach the bottom first? People have no idea. (In fact, the university that did the study found that physics professors weren’t any better at this than normal people, without first doing their mathematical computations). This isn’t surprising considering the brain has no way of figuring out problems like this. Like our sense of space, which is only partially correct, our brain’s intuitive sense of how objects move and behave is only partly correct as well. What does this have to do with personhood and the self? People don’t move in simple patterns like the objects of the world. Their movements are largely unpredictable. If I were to throw a baseball in the air, it goes straight up, then back down toward the ground. But if I throw my arm up and it stops mid-way in its free-fall, you’re not surprised. Why is this? You say, “Jason stopped it for some reason.” Our brains evolved a separate area to identify special objects (living things), and we process them via a different system. When an object seems to be “attuned” to its environment, responding to stimuli it like an animal with sense organs, we process it using special brain regions. Instead of using the brain’s physical mechanics system, it instead analyzes motions of these special objects according to “intentions”. It thinks in terms of locations of food sources, mating, desires, and trying to get “inside the head” of the thing you’re looking at. We think, “What does this thing want? What is it after? What is it trying to accomplish?” Your brain tries to imagine what that thing will do by simulating what you would do in that situation, and so forth. This intuitive and automatic intention system is what we’re mistaking for free will. People were too complicated to understand by other means, so the brain evolved the easiest route to analyze these complex behaviors – self reflection. It’s not that people have free will. It’s just our brains gave up trying to predict such complex behavior and instead found a new way of dealing with others. This sense of “self” has allowed us to interact and cooperate with others in ways we couldn’t have otherwise. To illustrate this point, think of autistic people. An autistic child will climb up your body like you’re just another piece of furniture to use. That’s because their “person network” in their brain isn’t working like ours, so they’re more “selfish”. Ironically, they’re not more selfish, they’re less so. They less understand their own sense of self and yours as well. And as anyone who has worked with autistic children knows, they’re harder to work with and are less cooperative. Our own sense of self is an illusion created by this person network. We’re not separate from our world or those around us, but our brain creates this illusion because it was useful for these human shells to cooperate. Even though it’s a fiction, it’s a good one. It allows us to love, understand, and work with one another. This explains why the self can’t be defined – it never existed to begin with. Like many things, when you look at the problem from the wrong angle, you never find a solution. The self is a useful illusion, nothing more. If you pull open the curtains, you find that it was never there, but it certainly feels real doesn’t it? Our own fear of death is a way for us to give value to our time here and to also value the lives of others as well. Even still, this all leaves me with a lot to think about. I think we’re so unhappy dwelling on ourselves because it’s a hollow illusion. There’s just not enough there to keep any real thinking person occupied, though it will leave you confused as you’re navigating the maze of mirrors. Tonight I want to briefly discuss artificial evolution using computer simulations. This is one of the coolest things ever. I wish I had time to actually write programs which do these things. This first video is rather ancient but I chose to include it because of how well it communicates the ideas. A computer programmer is going to simulate biological evolution on a computer and evolve all types of walking and swimming creatures. Virtual beings control body blocks which are all jointed together and moved by a virtual nervous system. A certain fitness routine is programmed in, such as walking, swimming, or jumping, and whichever virtual being is best at doing the task gets to “reproduce” and all the others are removed. He then takes that winner, makes random modifications to it, and then runs the simulation again. You do this over and over and over, and lo and behold, you get organisms that behave just like real world organisms. You get little walking creatures, swimming fish-like creatures, and so on. They naturally evolve fins and tails, and jointed bodies, and everything. What’s most fun is watching creatures evolve strange solutions to the problem. I think this is going to become a very common engineering method in the future, where instead of having to worry about programming all the details into a robot, you would just artificially evolve it in the computer. Then whatever it came up with, you place that program inside the real robot and you’re done. Need a robot which can walk up stairs, climb ropes, navigate rough terrain, and do countless other tasks? Just put a virtual staircase and everything else in the simulation and simulate that robot’s body, whatever shape it may be. Program a fitness function into the simulation which represents the ideal you’re striving for, and then let it learn to do everything by brute force trial and error, millions of iterations of evolution, until it perfects it. You yourself wouldn’t even need to know how such a creature does what it does. You just have to know what you want and then mine the computational universe for a solution. That’s awesome. In this next video a computer programmer “taught” a robot to walk through evolutionary algorithms. But “fitness” can be anything to a computer. This concept isn’t limited to biology and evolving bodies or their control systems (nervous systems). Your fitness function can be not dying in Mario and the algorithms will brute force solutions to how to beat levels in video games. This is a bit inefficient, but it’s the exact same idea. In a general sense, what you have is some system with lots and lots of possibilities. There’s a certain solution you’re looking for and you’re going to have to search for it. The better the fitness function, the less “brute force” attempts you’re going to need to find it. The solution could be a perfect score in a game, a control system for a robot, whatever. A big part of AI is to be able to quickly sift through possibilities and root out those that are obviously not what you need to do to achieve your goal. Like the AI playing Mario. If instead of pure brute force, it had a representation of that game’s world in its “head”, understood the capabilities of its enemies, and that its goal was to get to the goal in the fastest time possible, it could immediately start work on those solutions and would come to a solution far more quickly. Our brains are such a system. In the largest possible sense, they’re a tool which “recommends” to us quick solutions to various goals related to our survival. Our very conception of space and the objects within it seem to be an outcome of the intricately evolved neural network AI system which is our brain, “programmed” over countless trials and errors over millions of years. It’s hard-coded to recommend quick solutions to practically infinite muscle contractions and movements you COULD do but never “choose” to because they serve no benefit. I mean, you could roll around on the ground like those evolved creatures in that program, but you never choose to. Your brain never recommends such actions because in the past, they didn’t help humans survive and reproduce. This idea of mining a computational universe of possibilities for solutions to problems is fascinating. Fitness functions are mining tools, and the better your simulation and constraints, the better these computers narrow down possibilities to an ideal solution that you need. I’m rather new to all this, but I find it all intriguing. Frozen Planet Is Finally Here! I’ve been waiting for this series to come out for the past six months or more! It’s the latest nature series by David Attenborough. He’s covering the Arctic and Antarctica. Seven one hour programs in gorgeous HD. These have always been my favorite TV programs to watch. Here’s a preview. Author JasonPosted on November 23, 2011 Leave a comment on Frozen Planet Is Finally Here! Many years ago the philosopher Daniel Dennett wrote an ingenious essay entitled Where Am I? It is a fictional story where the pentagon asks the professor to go on a top-secret mission deep within the Earth, but in order to complete the task, they need to remove his brain from his body due to extreme radiation. They put his brain in a vat and then connect it to another body using wireless electronics. Dennett then controls this second body for the mission, complications happen, and well, many interesting questions about identity and space are addressed throughout. Professor Minsky, who was in charge of the operation, connected Dennett’s brain to a super-computer which was simulating his brain activity exactly. At some points Dennett is controlling his remote controlled body via the super-computer and at other times via his brain. I won’t ruin the rest for you. I originally read the essay in a cognitive psychology textbook of mine, but I’ve just recently found out that he has made a “docudrama” acting out this entire scenario on film! You have to watch it. I loved it. I honestly think that humans will eventually shed their physical bodies in favor of remote controlled prosthetic bodies. Not clunky looking cyborg bodies, but elegant bodies which are more beautiful and well constructed than our own. Made of stronger materials, not needing all the burdensome upkeep, and much easier to repair if something goes wrong. We’ll have mastered fusion power and have practically limitless energy. We’ll erect giant super-computers which will simulate a virtual universe filled with all sorts of worlds in which we’ll stay “plugged into”. Robotic sentinels powered by AI millions of times more intelligent than our own minds today will keep our brains functioning and when we wish to explore the real world, we’ll “possess” a robotic body and use it. There won’t be a need to travel from point A to point B. We’ll move as fast as our information technology. I don’t think I’ll live long enough to see it (absent some huge breakthrough in medical technology allowing me to live for a very long time), but within a few hundred years things are rapidly moving that way. It sounds like science fiction, but just study it out and look at the technology. Something incredible is evolving here on planet Earth. A lot of questions about space and identity arise in these scenarios. We tend to associate ourselves with our bodies, but even by simply removing your brain and remotely connecting to another body removes that problem. That’s not even counting virtual reality and its possibilities. And are you even really your brain and nervous system? To some extent you certainly are, but say you’re a mean-spirited person, unkind, and always unhappy. We’re tempted to say, “So and so is such a mean person. I don’t like him.” But there will come a time in the not so distant future when we can implant small chips in a person’s brain which dampen signals from some regions and amplify signals from others and lift them out of depression, hatred, or any other unwanted behavior. When your brain is in a vat, filled with nanobots supplementing your brain and altering its signals, you would consciously have experiences, but you’re not stuck with any particular personality, level of knowledge, or temperament. We’re not anything which we currently think we are. We’re not our bodies. We’re not our location in space. We’re not our personalities. We’re not our gender. We’re not our thoughts. We’re not our desires. We’re not what we know. I don’t know what we are, but we’re not any of those things, at least not absolutely considering they’re all subject to change, especially with advances in technology. We’re something beyond all that. Beyond morality. Beyond feelings. Beyond emotion. The collective consciousness of humanity is slowly rising from the depths, though it’s still wading around in the mud. Originally we couldn’t accept anyone who worshiped a different God, wore different clothing, styled their hair differently, spoke differently, and had different cultural values. Later we matured and realized the value in freedom, and governments allowed freedom of speech, freedom of religion, and protected minorities from the majority. Humanity flourished in ways it had never done before. Next we struggled with skin color. Segregation was eliminated and humanity further prospered. Even today racism is rampant, but it’s been diminishing with time. Our next step is to accept gays, lesbians, and transgender individuals. We’re not our gender or sexual orientation. We’ll move beyond that. Then we’ll move beyond geographic borders and stop fighting with one another over fictional lines drawn in the sand. Later we’ll hopefully learn that a person isn’t what he or she does. Their actions are a consequence of their nervous system, not some immaterial “free will”. People seem to understand this in bits and pieces, such as economists pointing out how people respond to incentives, sociologists indicating how the poor and struggling are more likely to commit crimes, and psychologists telling us how people’s desires can be shaped by their culture and environment, but we still haven’t completely caught on. We still hold to deep seated convictions of responsibility, justice, and retribution, and base our society around them. We point fingers at individuals and say, “You’re bad. You’re no good. You’re evil.” Instead we should ask, “What environment did this person live through? How was this person raised? What was he or she exposed to? What are his or her brain scans showing? Is everything functioning?”, and so on. Empty blame won’t tell us why a person did what they did or help us learn how to fix the problem. We’ll attribute it to their “free will” and say, “it’s uncaused, their spirit made a decision which controlled their body to do this or that”, instead of asking, “Why did this person do that?” I think we still need laws enforcing retribution and justice, but very few people realize how the brain is chemistry all the way down. As we do so, humanity will move into a new level of love and compassion, and instead of cruelly executing people, we’ll further research which brain areas aren’t firing, such as why the mass murderer feels no guilt or compassion, and supplement his or her brain with new implanted hardware, fixing their mind and behavior. I think humanity is up for a long train ride and it’s going to be hell, at least initially. This new technology is going to force governments to change and it’ll require radical shifts in our collective consciousness. Religion is being thrown against the wall as more and more facts show how bogus its claims are and they won’t give in without a fight. They’ll contest every form of progress and consider these developments as playing God and blasphemy. Religiously motivated terrorism will only increase. Our economic systems are failing us as more and more efficient methods of production are coming into place. Robots will eventually take over all mundane work, and keep climbing in capabilities and worth to employers, leaving normal people unemployed. Eventually people won’t need to work at all to live, but it’s unlikely that our governments and social institutions will be able to keep up with the rapid changes. Millions and later billions will be out of work, trying to compete with augmented humans with better skills, trying to find ways to afford prosthetics, and struggling to work within this system of money, trade and competition. Wealth disparities will be far beyond what they are today, and there will surely be wars and riots. When people can download knowledge and skills into their supplemented brains, old ideas of identity have to go. Humanity may well be wiped off the planet by rich transhuman overlords who view them as worthless and have the masses exterminated. But with all these new developments, people will be connected in ways they never have been before. They’ll be able to share information and knowledge at the speed of light, brain to brain transfers. Think about when we can beam experiences to one another. Millions and even billions could instantly be made aware of injustices, “teleported” right on the scene. We’ll be able to simultaneously receive information feeds from the same body and share near exactly the same experiences. There will probably be movie theaters where thousands or even millions of people connect to the virtual body of a character, and we all live that character’s life, and see their perspective, live their thoughts, and feel their emotions. And since it’ll be digital information, countless different perspectives could be absorbed and analyzed in ways far beyond what our internet and blogs are today. There’s a lot to think about, and it’s all coming too fast to even begin to understand.